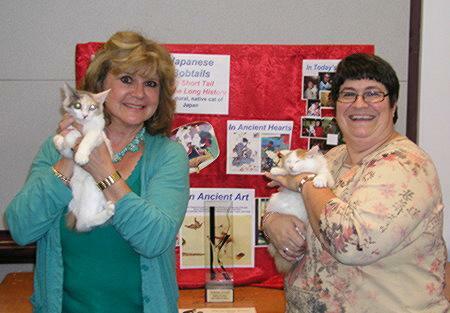 The Japanese Bobtail exhibitors and Japanese Bobtail Fanciers club members who went to Texas were treated by the locals in great style. 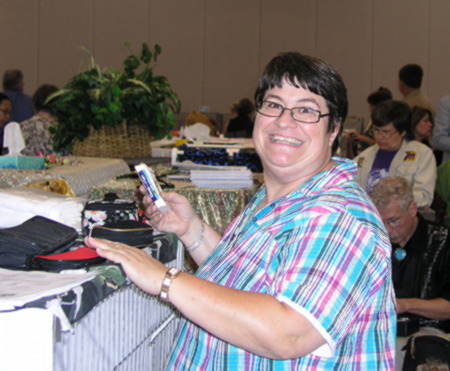 Exhibitors who attended were (alphabetically) Marianne Clark, Linda Donaldson, Joe Edwards and family, Gena Garton, Toni & Paul Huff, Paula Noble, Scott Thorniley, and Judge Lynn Search. 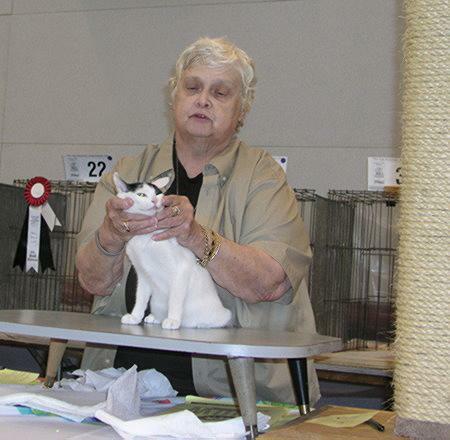 The ring that Lynn judged on Saturday was sponsored by the Japanese Bobtail Fanciers CFA breed club and was completely staffed by JBT breeders/exhibitors. 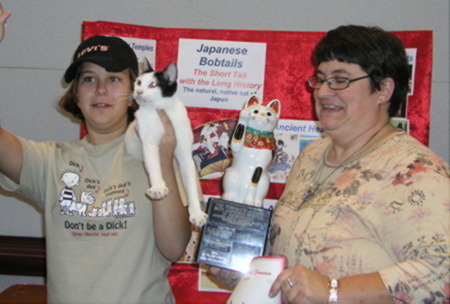 Marianne Clark clerked and Joe Edwards stewarded so that his granddaughter, Jessie, could concentrate on showing his Japanese Bobtail in Premiership.. The hotel provided shuttle service not only to and from the airport, but to and from the show. Saturday night we had an informal dinner at the hotel bar and a short meeting in Paula’s room. JBF rosettes and Breed Council Booklets were presented to the previous season's JBT winners at the get together. The get-together was planned as a group dinner in the dining room. Unbeknown to us the Hotel closes it’s dining room on Saturdays because they don’t get enough business – therefore we couldn’t have a dinner meeting/awards presentation. Instead we ate strung out in a line along the back wall of the bar room eating at little round bar tables for two, hardly the setting for discussions and presentations. 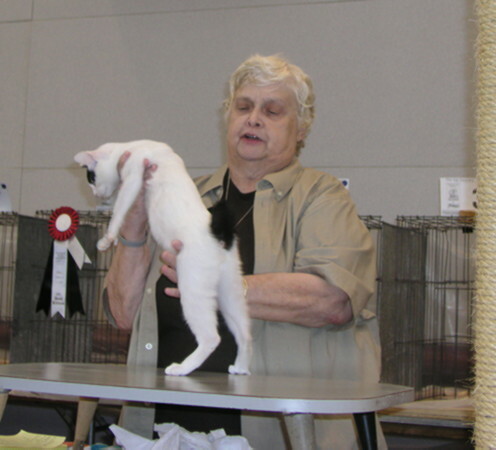 Thank you to the Tonkinese Breed Association and the Stars & Stripes Cat Club for their gracious hospitality and the hard work on this new format. 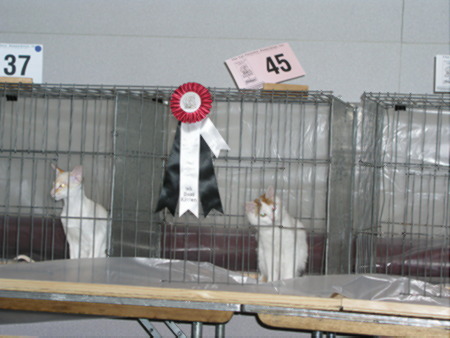 There were two shows: Saturday was a six ring show and Sunday a four ring show. 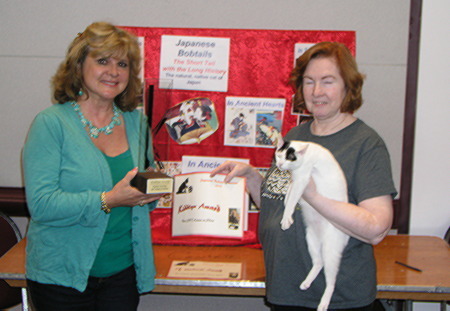 The winners of the annual Japanese Bobtail trophies were based on Saturday’s show – at the end of the day scores were tallied by Paula, who Master Clerked, and the winners were presented by Judge, Lynn Search and JBF President, Gena Garton. 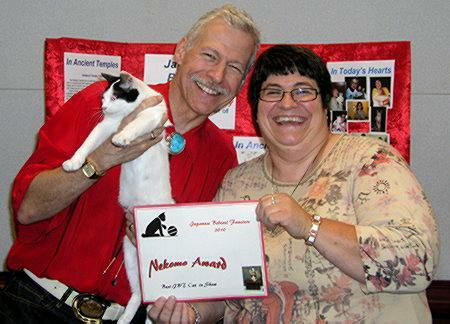 Linda Donaldson and Scott Thorniley took the pictures which are featured here recording the awards presentation.